You have to give a presentation in a half hour that highlights your business, your value proposition, and everything you’ve been working toward. Judges from local companies will be evaluating your pitch and deciding if they’d like to do business with you. So how are you feeling? Need a little stress reduction? If you answered stressed or anxious, you’d be in good company. On November 13th, about 60 small businesses and entrepreneurs in the Jax Chamber’s Jax Bridges program had the opportunity to pitch – and many of them were a ball of nerves. Well, duh – that was the main goal! But why was it effective? Because it got the participants out of their heads and into their bodies. When you’re playing a drum, you need to be fully present and in the moment – no looking at your phone or glancing at your note cards one more time. You focus on the task at hand and keep the beat with those around you. This usually helps distract participants from their nerves. Speaking of distraction, when we start looking around us and matching our beats with that of others, we start to listen more deeply to the sound being created. Then we start to figure out what others need from us – what we have to contribute to the sound of the whole group. This helps a lot with the stress reduction as a result. Lastly, we knew we’d be sitting down listening to everyone’s pitches for a good two or more hours. Wouldn’t it be nice to get in some movement before then? To warm up our bodies, feel comfortable in our skin, and practice our confident postures? By the time the pitches began, everyone was more calm, cool and collected. Half of us went in one room to pitch to half the judges, the other half in the other room. In my room, right before we began, someone asked if I could play my drum again to help calm the nerves. We laughed, we cheered for each other, and we all went up and crushed it. Is your group or team doing a presentation and would like some help quelling the nerves before the big event? Contact us to talk about a stress reduction icebreaker! 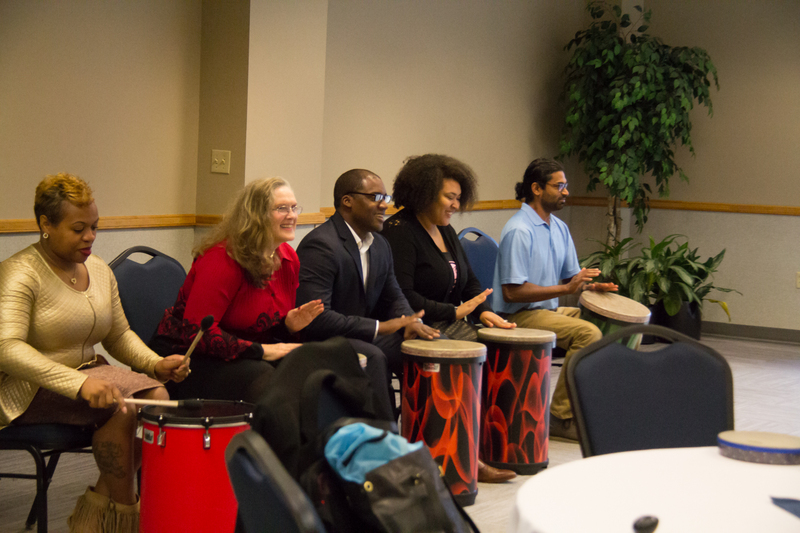 The drumming session was a post-lunch energizer that focused on fun teamwork activities. We also highlighted some of the themes of the day and what people were taking away from all the sessions they had attended. During the event, we were able to tackle quite a few of our favorite drumming and teamwork activities including…. We had a drum jam where we played the rhythm of our heartbeats. We also created rhythms about key takeaways the attendees got from their earlier morning sessions. One attendee mentioned the importance of reflecting on and sharing one’s unique story. Next we played a rhythm game called Rumble Ball to demonstrate the accessibility of rhythm to all ages and populations. The facilitator throws a ball in the air and while it’s airborne, everyone rumbles on their drums. When the facilitator catches it, everyone stops. With a high ceiling, you can throw really high and get some energetic rumbles. Participants took turns being the leader and creating rhythm patterns with the starts and stops of the rumbles. Finally we ended with a relaxing rhythmic breathing exercise, one of our favorites to share. It encourages participants to align their breathing with a gentle but rapid tapping on their laps to take deep, mindful breaths. It slows the heart rate and helps relax and re-energize. One person commented they felt “comfortable but energized” at the end of the exercise. 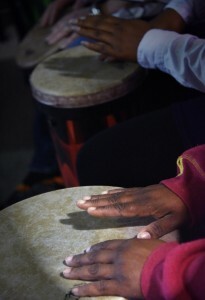 Another person commented, “what was most powerful was that the session allowed collective energy coming together and also autonomy.” This is our aim with rhythm experiences – participants discover their connection with others around them while also empowering themselves to discover the rhythm within! 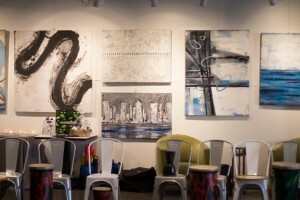 How can we add rhythm to energize your conference or event? We would love to partner with you. Contact Us Today! You can learn more about the Mayo Clinic in Florida HERE and to learn more about the symposium you can click HERE. © Just Add Rhythm All Rights Reserved. SEO Consulting and Social Media marketing services by Cipher Works. Powered by zAlive.